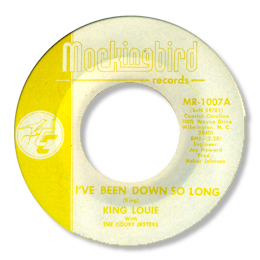 Originally from Wilmington NC, Louie King was a big local draw offering a dynamic and entertaining stage act at such venue’s as Paul’s Lounge. He first cut for the local Mockingbird concern. This label had a few soul releases in its catalogue, but the best I’ve heard is this one. “I’ve Been Down So Long” is a deep ballad constructed in the classic format – 12/8 signature, guitar/organ combination and horns. I like the “climbing” chord changes very much, and the “lo fi” arrangement but the best part is undoubtedly the finale when Louie really cuts loose, testifying and dramatically raising the emotional temperature. King was one of the first black artists through doors of Reflection Sound studios in Charlotte, NC, in 1970, cutting sessions in the spring. All the cuts featured Roger Branch’s backing band and are splendid southern grits, with King’s strong baritone voice riding over a quality rhythm section and full horn section. “Our Love Will Overcome Everything” – cut twice in almost equally strong versions – and “Your Turn to Cry” are first class groovers, and the downbeat “I Remember (The First Day We Met)” shows the power of King’s vocal stylings, but the pick of the bunch has to be the busy Come On Home with a superb horn chart. A shame that none of these cuts saw the light of day at the time. Note ~ All of King Louie's Reflection Sound recordings can be found on the Grapevine 2000 UK CD "Carolina Soul Survey". Special thanks to Garry Cape for spotting yet another senior moment from Sir Shambling, and helping him to get this right.